Combination power and thermocouple cables are required for 1, 2, and 3 zone systems. The individual cables provide both power output, and thermocouple input connections for the systems. 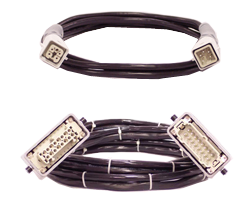 1 and 2 zone systems use the MPTC-10M cable. A 1 zone mainframe requires 1 cable while the 2 zone requires 2 cables. 3 zone systems require the MPTC-3-C10M.